Originally expected to resign, Mike Krzyzewski will try to lead the U.S. men's Olympic basketball team to a third straight gold medal. 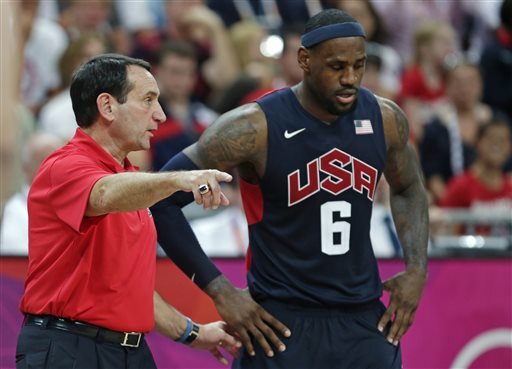 Mike Krzyzewski had decided to remain coach of the U.S. men’s Olympic basketball team. Krzyzewski will try to lead the Americans to a third straight gold medal, a person with knowledge of the decision said Wednesday. Originally expected to step down, Krzyzewski will hold a news conference to confirm his return Thursday at Duke, the person told The Associated Press on condition of anonymity because no official announcement has been made. The Hall of Fame coach has led the Americans since 2005, winning gold at the 2008 and 2012 Olympics, and the 2010 world basketball championship. His return was first reported by Sports Illustrated. Krzyzewski repeatedly said he planned to end his international coaching career following the Americans’ victory last summer in London. Yet USA Basketball chairman Jerry Colangelo preferred to hold off any discussion until after Coach K finished his season with the Blue Devils, and he got the answer he wanted. The 6-year-old Krzyzewski will lead the Americans next summer at the renamed World Cup of Basketball in Spain, where a victory would qualify them for the 2016 Summer Games in Brazil. They are 62-1 over the last seven years. Krzyzewski’s return could help land commitments from some of the top NBA stars who have enjoyed playing in the program he and Colangelo revamped in 2005. James, Kobe Bryant, Chris Paul and Carmelo Anthony are among the All-Stars who have won multiple gold medals under Krzyzewski. James has said he would like to be there in 2016 as well. The U.S. team had been led by an NBA coach from the time NBA players were first used in the 1992 Olympics through the 2004 Games, when the Americans lost three times and finished third. They managed only another bronze in their first tournament under Krzyzewski, the 2006 world championship, but haven’t lost a game since while restoring the U.S. as the top team in the world. Krzyzewski said he expected the Americans to name a successor this summer, but Colangelo believed Coach K wanted to stay if his family and Duke were comfortable with it. Krzyzewski, a graduate of the U.S. Military Academy, has been on the staff of 13 U.S. teams since 1979 and joined Henry Iba as the only coaches in Olympic history to win back-to-back men’s basketball gold medals. Heat forward Shane Battier, who played for Krzyzewski at Duke, said he wasn’t surprised that his former coach decided to head back to the USA Basketball sideline. Colangelo never even talked to another candidate, insisting Krzyzewski had earned the right to take as much time as needed. The Americans wanted to have a coach in place before holding a minicamp in July in Las Vegas. The person said there were expected changes to Krzyzewski’s staff, which had included NBA coaches Mike D’Antoni and Nate McMillan, and Syracuse coach Jim Boeheim.